What can be more exciting than standing in the water and floating over the waves as you paddle around? But while SUP (Stand Up Paddle Boarding) is very exciting, it’s still dangerous if you don’t have the right gear on you. Since you can never predict how the tides move, you will need the best SUP life jacket. *Keep reading for the fulling buying guide or jump straight to the reviews! Why Do We Need the Best SUP Life Jacket? No matter how much of a good swimmer you are, you can never predict when disaster is going to strike. One simple change of the tide and you will be pushed underwater, with no chance of regaining your composure. A PFD (Personal Flotation Device) is basically a life jacket that will help you regain your “footing” if you happen to fall in the water. Most tragedies don’t happen because the user didn’t know how to swim; they happened because people were pulled into the current too fast, without the means of getting above-water. The best SUP life jacket will give you the nudge that you need to raise yourself above water, where you may finally use your swimming skills. Plus, depending on where you go paddling, you may be required by the law to wear a life jacket. What Are the Different Types of SUP Life Jackets? Just like paddle boards, a life jacket will come in a variety of styles that you choose based on your age, height, and weight. There are five types of life jackets that you may choose from, four of them often being recommended for SUP. This type of vest is durable and bulky, made for extreme sports lovers that enjoy going into remote or restless waters. Since the inflated part is at the front, its purpose is to turn you over with your face up so that you remain buoyant and safe. A less bulky version of the off-shore type, this one is the best SUP life jacket for calm waters near the shore. Some vest models will also turn your face up as you are waiting for help to come. 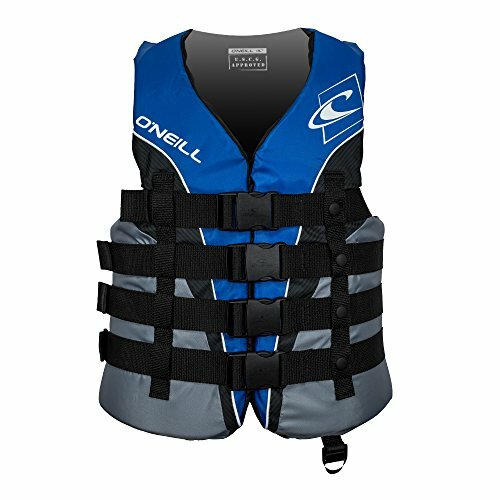 This type of life jacket is lightweight and offers a wider motion range. It’s the more comfortable option for you, the user, but it should only be used if you know for certain that help will be quick to come. These may fall into the category of “life jackets,” but they aren’t necessarily life jackets. Instead, they should be used as aids to the life jacket. These are inflatable devices that can be thrown into the water so that the one in peril can grab and float around until help comes. The best SUP life jacket can be used for all types of water sports safely – but there are also jackets that were designed with a specific use in mind – in this case, SUP. 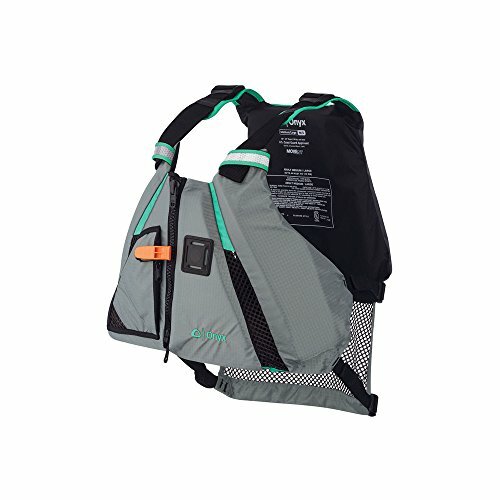 What Are Other Features to Consider in a SUP Life Jacket? If the size is wrong, then everything else is wrong too. To ensure that the vest works properly, you might want to be careful on the size. They should be a snug fit around your chest, but still, allow you enough freedom of movement to work the paddles around. This video will show you exactly how to choose the proper size and fit of the best SUP life jacket. Buoyancy is a crucial force needed to keep yourself above water. The majority of the people have at least some natural buoyancy in the shape of body fat, so they may only need at most 12 pounds of buoyancy to keep them up. On the other hand, if you are a fit person, then you may want to go for more buoyant life jacket. A SUP life jacket with the right features will also allow you freedom of movement on the waters. Since you’ll be moving around and paddling, the last thing you’ll want is a jacket that won’t let you properly move your hands. Some vests come with tabs that allow you to attack a whistle, a knife, or any other accessory. Pockets are also useful when it comes to SUP, and you may want to go for bright colors that are easy to spot. Finally, you will want to consider whether the fabric is good for winter use or not. If you’re going to paddle in cold weather, you might want to make sure your best SUP life jacket can keep you warm. This life jacket has a lot of features that you might appreciate as a water sports enthusiast. Having a mesh lower back, this jacket will fit snugly around your body so that you can stay secure – all while improving the vest’s ergonomics. The MoveVent features two adjustable lateral straps that make it easier for you to adjust the vest in place as you are paddling. This feature will also keep the vest from rising as you are on the water, therefore ensuring that you are fully protected. The expandable torso and shoulder straps provide a lot of leeway, so there’s no problem if you got the vest one size too large or too small. Since it fits securely around the chest, it can be the best SUP life jacket for women as well – and it looks cool to boot! 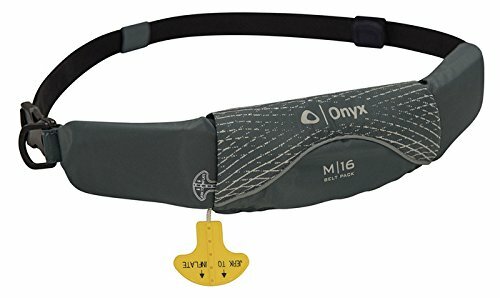 If bulky life jackets are not your thing, then you may want to consider the Onyx M-16 inflatable jacket. 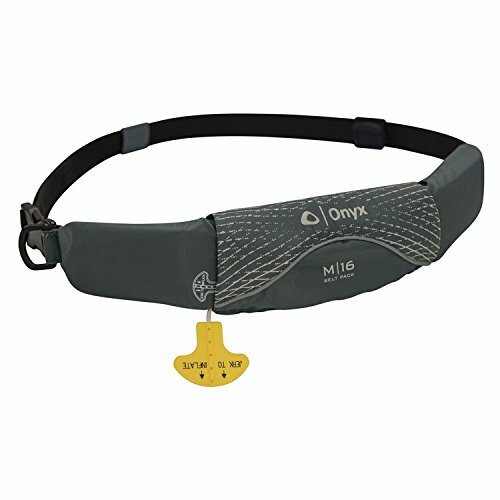 This product resembles a belt but does the job of a life vest. Once inflated, it will keep you above water long enough so that you stay alive until help comes. Since it takes so little space, it allows a lot of freedom of movement. There won’t be any restrictions – and unless you have to inflate it, you won’t even know you are wearing it. It’s nothing like your conventional life vest. Aside from being small, it is also incredibly light – which makes it perfect for stand-up paddle boarding. It’s also very easy to fit even on short people thanks to the Velcro-style clasp. Out of most life jackets, this is the most comfortable one, making it the best SUP life jacket. The M-24 is an improvement of the M-16, with the purpose of being used for deep waters as well. This vest is quick to inflate if emergency asks for it, and it will float you to the surface promptly. The red handle is very sturdy, and you may be required to pull harder to activate it, but this is just a safety measure to prevent the accidental activation of the vest. Like the M-16, it’s barely noticeable when it’s not inflated. You may use your arms and legs freely, and you will be able to swim without being hindered by an uncomfortable vest going around you. The Velcro is also reliable and enables even short and thin people to get a proper fit. This life vest has been specially designed for men and their big torsos. It may not be “one size fits all,” but the right size can be adjusted to the perfect fit. It even has sizes for highly overweight men, being a perfect solution if you have some extra pounds. The vest itself is very comfortable, and it doesn’t hinder you in any way. You can freely move your arms as you are paddling, and it won’t restrict you as you are turning, moving around, or swimming. The nylon is also perfect for colder weather since it will keep you warm. It will also dry quickly, and while the fiber can get water, it won’t hold it for long. If you are looking for something less fancy, then the Stearns model is the best SUP life vest for you. It’s simple, yet effective and very comfortable. It is also one of the most affordable options, so if you are tight on budget, this is the one for you. This life jacket will provide a tight, but comfortable fit. 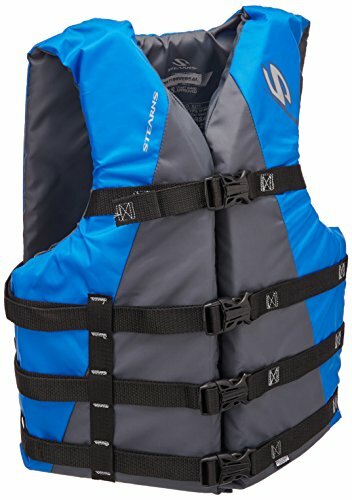 If you fall in the water, the vest will not travel up all the way around your neck, as a lot of similar life vests do. It will fit snuggly. The Stearns vest is neither too bulky nor too heavy, making it perfect for board water sports. You can move your arms around freely as you paddle, and it won’t restrict your movements. The fabric also retains heat, so it’s perfect for use in colder weather. When choosing the best SUP life jacket make sure to stick to one that is up to regulation, fits nice and feels comfortable. You'll be wearing it all day, so comfort needs to play a huge factor. Which is your favorite life jacket for paddle boarding? Let us know below! Want up to date fishing tips, tricks and reviews? Previous articleGifts for Kayakers: The Top 7 Gifts They’ll Love! Always on the water; always on adventures. The Best SUP Leash: Why a Breakaway SUP leash WILL Save Your Life. Earnings Disclaimer: When you buy certain products from some of the sites which we link to, River Rat Guide receives a commission. River Rat Guide talks about all things water. Kayaking, Paddle boarding, canoeing or Fishing, we love everything you can do on the water, especially if it involves a paddle. Riverratguide.com is a participant in the Amazon Services LLC Associates Program, an affiliate advertising program designed to provide a means for sites to earn advertising fees by advertising and linking to Amazon.com. Additionally, Riverratguide.com participates in various other affiliate programs, and we sometimes get a commission through purchases made through our links at no extra cost to you!